Looking to spend less? Pack lighter? Maybe your kids are camping, too. Don’t worry, because there are even options for the coziest sleeping bag and sleeping bags for two. Take a fall or spring camping trip or a nice summer trip in the mountains. If you’re camping in 20 degrees Fahrenheit or above, we’ve found a three-season sleeping bag pick for you. Do you want a great sleeping bag for an even greater price? The Obosoe Sleeping Bag is a great value all around, but an absolute steal at this price. It’s rated for temperatures down to 30 Fahrenheit and sports a range of comfort and durability features. The sleeping bag is 85 x 31.4 inches, but can fit compactly inside of its small pack (18.5 x 11.4 inches). The 3.3-pound sleeping bag-and-pack combo makes travel easy, especially since the pack has compression straps that are great for grabbing the bag or lashing it to a pack. Comfort isn’t an issue with the Obosoe thanks to the extra fluffy cotton filling and soft interior. And with multiple zippers, you can keep the bag opened at the bottom for a more breathable experience. If you’re camping in a windy, rainy, or cold location, using this sleeping bag will be to your advantage. With drawstrings to keep drafts away from your shoulders and your head warm in the hood, you’ll feel cozy and warm in inclement weather. The exterior is even waterproof, so you’ll be sure to stay nice and dry despite the dew or light rain if you’re open-air camping. While the OBOSOE is a good-sized sleeping bag, the Winner Outfitters Mummy Sleeping Bag has a more compact travel design. 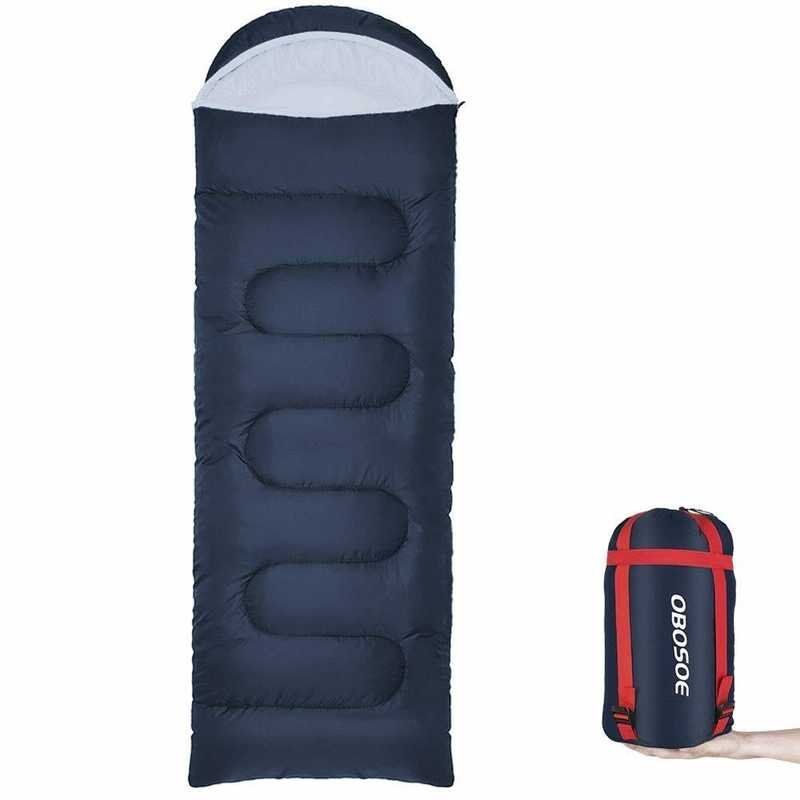 It’s a little longer than the OBOSOE Sleeping bag (87 x 32 inches), but when it’s inside of its bag, the size is 14 x 8 inches—taking up significantly less space. At 2.8 pounds, it’s also a pretty lightweight bag compared to its competitors. The Winner Outfitters Mummy Sleeping Bag has an obvious mummy-looking design that will keep you snug and warm anywhere from 20 degrees Fahrenheit and above. 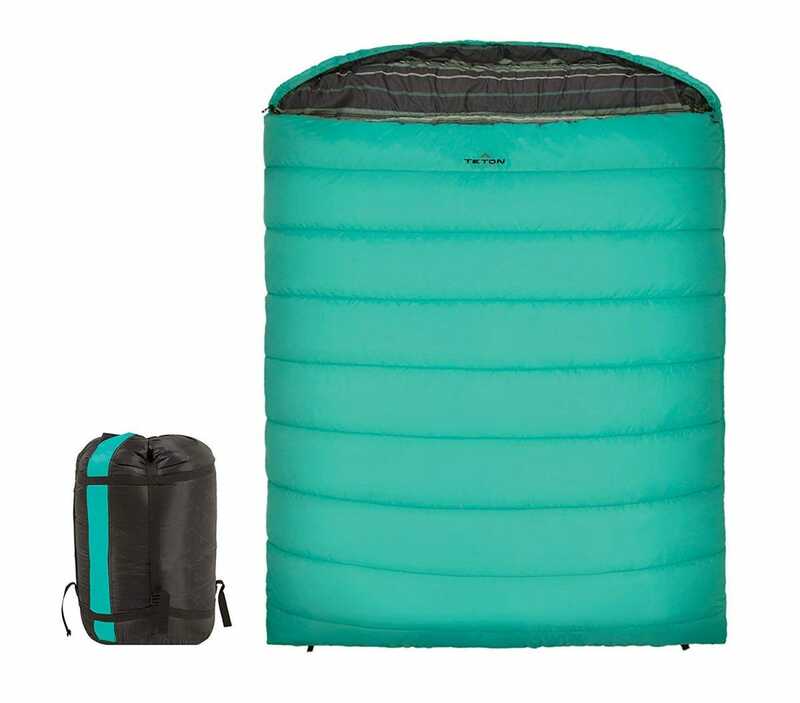 Heat can’t escape easily with this sleeping bag thanks to the draft collar and tubes, which are simple rolls of insulated fabric around the neck (collar) and zippers (tubes) of the bag. They act like a draft guard for a door, keeping air from seeping through. Lastly, the Winner Outfitters Mummy Sleeping Bag is water resistant and even has comfortable and breathable fabric on the inside to keep dampness out. Kids can easily get enveloped by a sleeping bag that’s too large for them. Get an All Season Kids Sleeping Bag so that they can sleep comfortably in a bag that’s made for kids 5’1” and under. Not only will they love having their own bag, but the sizing means they won’t be left swimming in it. And just because it’s made for kids doesn’t mean it’s not durable or warm! It designed for temperatures as low as 32 degrees Fahrenheit and is made out of waterproof material, highly-insulated fill, and soft, non-scratchy interior. The All Seasons Kids Sleeping Bag has a hood with drawstrings to keep your child’s head warm in cold temperatures. There’s even a pocket on the inside of the bag to store a phone, flashlight, or snacks. Completely unzip the bag to turn it into a full-sized comforter for those warmer nights. Packing this All Season sleeping bag back into its carrying bag is a breeze, too. Camping with a 2 or 3 people you don’t mind snuggling up to? Instead of lugging around separate sleeping bags, just bring one! 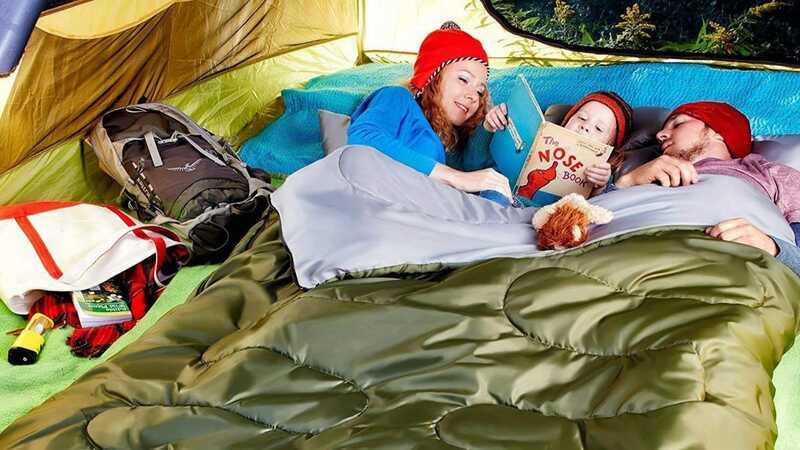 The Sleepingo Double Sleeping Bag is 87 x 59 inches, and can fit two adults with extra room to spare (that spare room is perfect for a small kid or two, or even your dog). 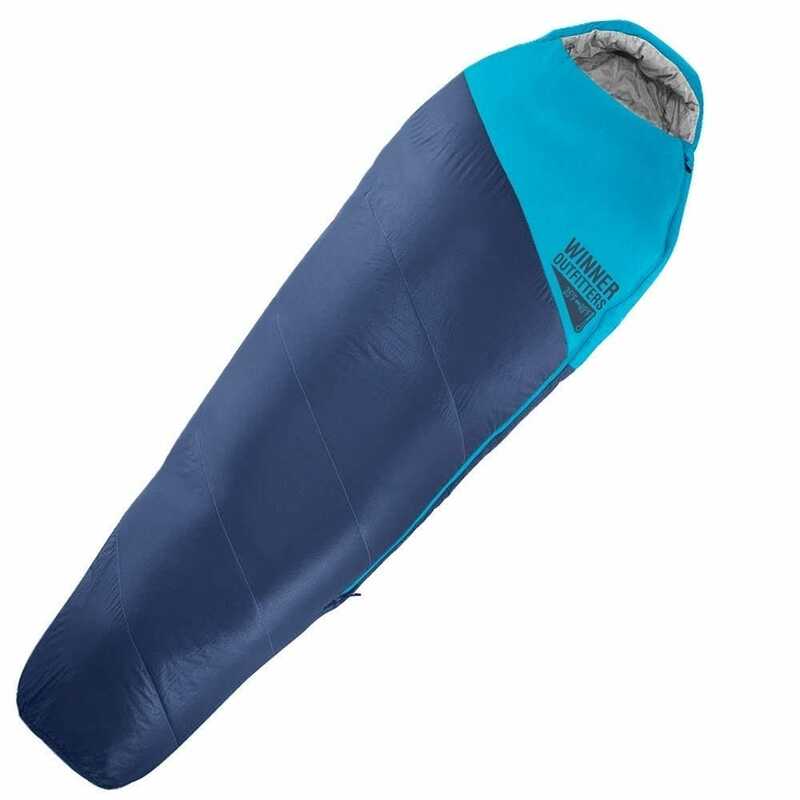 It can even be used as a large sleeping bag for one or unzipped into two separate sleepings bags! With a durable waterproof exterior and a soft and silky interior, you’ll forget you’re even camping. 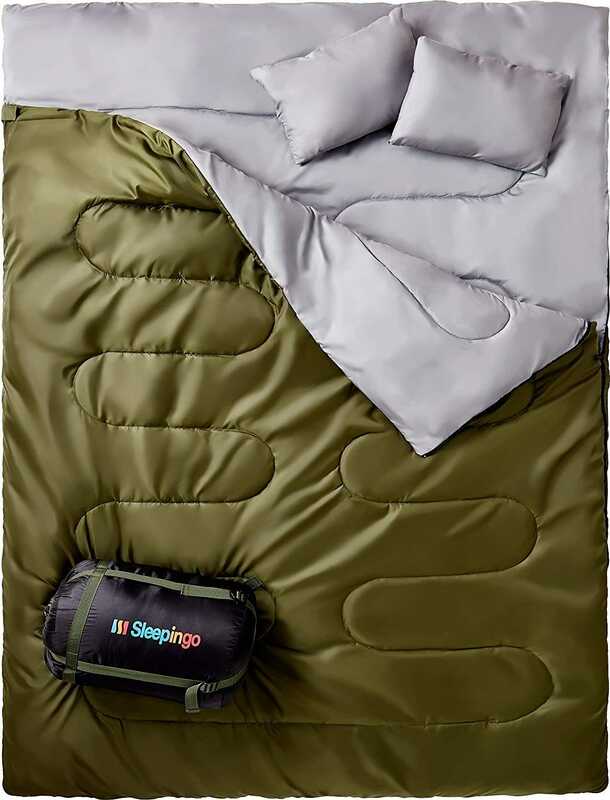 The Sleepingo also comes with two travel pillows that easily fit inside the travel bag. 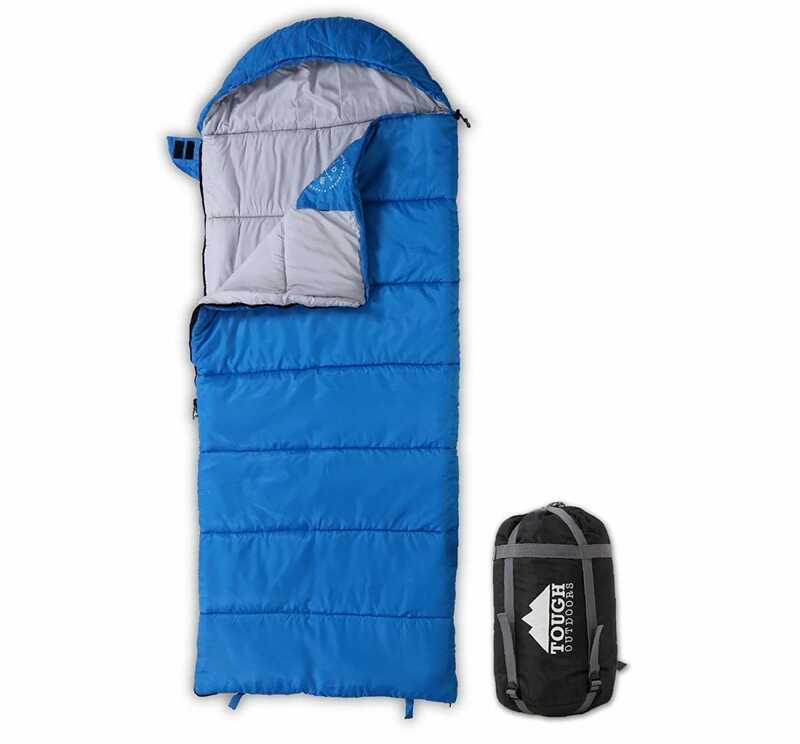 For 32 degrees Fahrenheit and above, this queen-sized sleeping bag is great for camping in comfort. It even has zippers on both sides, so if you need to exit, you won’t have to wake up your partner. In terms of versatility, it’s hard to beat. Want a sleeping experience while camping that doesn’t feel like you’re sleeping on the ground? With the Teton Sports Sleeping Bag, you’ll be able to sleep comfortably because of its fiber-filled inside. While this gives you a little extra padding, note that if you’re looking for an even more comfortable camping experience, consider getting a camping pad like this Outdoorsman Ultralight Sleeping Pad. Aside from the padding, the interior is made of a super soft poly-flannel lining and has draft tubes to ensure heat stays in, like the Winner Outfitters Sleeping Bag. There’s a hood with drawstrings to keep your head warm while also keeping wind and drafts out of the bag. And to make sure you’re warm in 20 degree Fahrenheit weather and above, the sides of the bag near the zipper are raised to ensure heat stays inside. With different interior designs to choose from, you can customize your comfortable camping try with style. Lastly, there’s a pocket inside the bag to hold your phone, wallet, or keys. If you like the idea of this cozy sleeping bag, but want a larger option, check out this Teton Sports Mammoth Queen Size Sleeping Bag. There are, quite literally, hundreds of Android phones out there, so picking the best one can be a challenge. Here are the best Android phones you can buy at various price points to help you narrow it down.